A holiday office party is an event where everybody joins in celebrating the accomplishments of one-year hard work. Not only your co-workers but also your boss and other executives at your company will attend the party. You may not want them to see you wearing a deep plunge V-neck or a translucid dress even if it’s the latest fashion trend. You can make a fashion statement showing your sense of style with a piece of jewelry or accessories. Wearing an outfit that it’s too revealing or too tight can ruin the professional image that you have worked so hard to create. Take into account the place, where the party will be held, the time, early afternoon or evening, and eventually the theme of the party. A party that takes place at a luxurious restaurant or hotel calls for a dressier outfit than a party held at the conference center where you usually have company meetings and events. Check out the hours; evening times suggest a formal attire while the event scheduled early in the afternoon requires a more relaxed dressing. Keep in mind the theme of the party and choose an ensemble that is appropriate with the place and time and style it accordingly. Imagine you would wear a red sequin dress when the party theme is white Christmas. You will stand out from the crowd, but you will feel embarrassed when people around you are all dressing up in white and cream hues. Wearing a pair of stilettos that kill your feet and you can barely wait to take them off is not a good choice. Feeling comfortable is the key. If you are not at ease in your outfit, it will compromise your chance to have a joyful time at the party. Choosing an outfit for the Holiday Office Party is a struggle for many people. 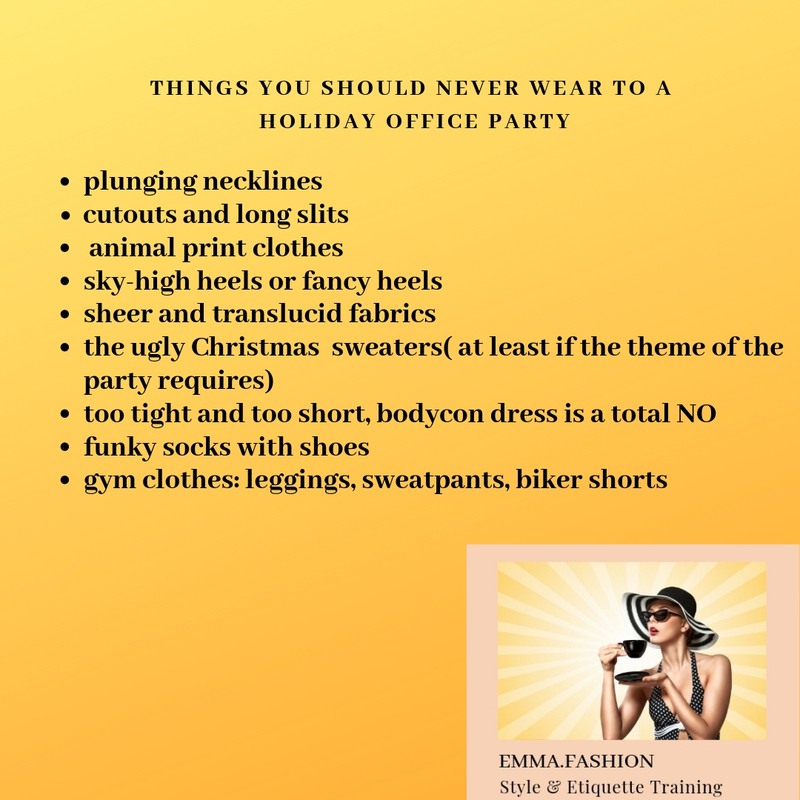 Here are a few tips to keep in mind before you decide what to wear to the party.